In September, W. Thomann AG, which is based in Ebikon in Lucerne, will become the first bookbindery in Switzerland to commission the three-clamp Vareo perfect binder that was launched by Muller Martini this year. “We believe it will make our production of short runs more efficient and ensure even higher quality,” says Managing Director Reto Thomann. 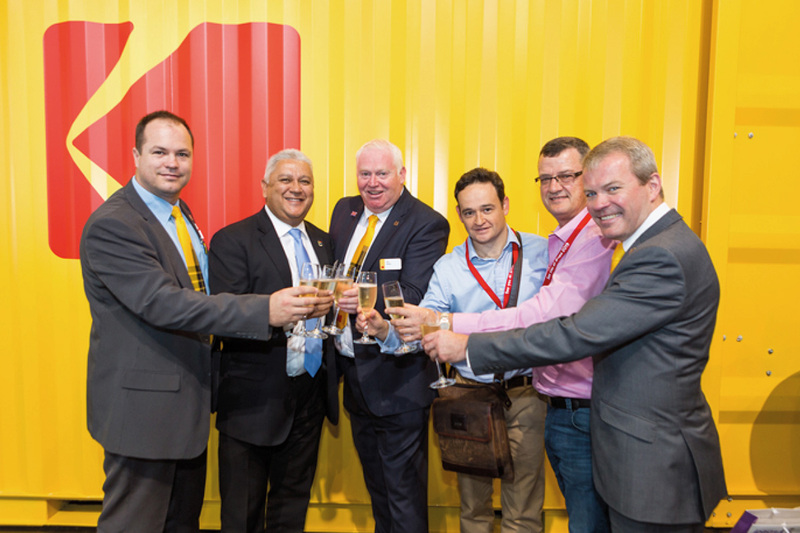 Kodak today announced a new agreement with Caxton, CTP Publishers and Printers Limited, one of the largest printers in Africa. The group publishes and prints more than 140 local weekly newspapers in 10 facilities in South Africa, including the Citizen Daily newspapers and prints various titles for major publishers. The order includes the installation of a KODAK PROSPER S30 Imprinting System on Caxton & CTP’s existing offset litho printing presses and represents the first variable print technology on African newspapers. The company will install an initial KODAK PROSPER S-series imprinting system to test, with the intention to expand to its other sites throughout the country in the coming months. Kodak engineers, along with partner Thunderbolt Solutions, will install the imprinting system directly onto the presses so that printing can remain seamless without adding an extra manufacturing process. “With the power of Kodak technology, we can for the first time create interactive ads and localize content by ethnicity, postcode and geographic area. And, because of the flexibility of variable print technology, we can update all that information in-real time,” said Jaco Koekemoer, chief executive officer, Coldset Printing (a division of CTP Publishers). The KODAK PROSPER S30 Imprinting System features pigment-based inks that deliver excellent permanence; rich, dark blacks and outstanding scratch-, fade- and water-resistance on a wide variety of commercial substrates. It runs at speeds of up to 3,000 fpm (900 meters/min) at a resolution of 600 x 200 dpi. Data can be split electronically between up to four print heads using the same controller. Kodak is a technology company focused on imaging. We provide – directly and through partnerships with other innovative companies – hardware, software, consumables and services to customers in graphic arts, commercial print, publishing, packaging, electronic displays, entertainment and commercial films, and consumer products markets. With our world-class R&D capabilities, innovative solutions portfolio and highly trusted brand, Kodak is helping customers around the globe to# sustainably grow their own businesses and enjoy their lives. For additional information on Kodak, visit us at kodak.com, follow us on Twitter @Kodak, or like us on Facebook at KodakNow. Caxton and CTP Publishers and Printers Limited is recognized as one of the largest publishers and printers of books, magazines, newspapers and commercial print in South Africa. We are involved in various fields of publishing and printing i.e. newspapers, magazines, commercial print, book printing, stationery, packaging and labels, as well as manufacturing ink for web presses. Approximately 5 500 people are employed by the group.